Molly Ellefson (right) offers one-on-one integrative health and wellness coaching sessions. Mindful eating, a concept based on Buddhist traditions, is a process of putting all your focus on the food you are eating. You eat slowly with no distractions, while noticing all the nuances of each bite: temperature, texture, flavors, and sensations in your body. While this can be a powerful experience, most of us aren’t able to eat like this all of the time. Then, how do we eat mindfully in the real world? In her book, “Eat What You Love, Love What You Eat,” Dr. Michelle May defines mindful eating as “eating with intention and attention.” When you eat with intention, there is a purpose for eating – to satisfy hunger, fuel your body and for enjoyment. When you eat with attention, you tune in to the sensations and flavors of what you are eating. You also pay attention to your body’s internal cues about satisfaction and fullness. 1. Before you eat, take a minute to think about why you want to eat. Are you physically hungry, bored or are you eating by the clock? 2. Remember that true hunger is a physical sensation. Physical hunger can feel like an empty or shrinking feeling in your stomach. You may also feel the effects of low blood sugar, such as: irritability, trouble concentrating, light headed, nauseated, or have a headache. 3. When planning what to eat, think about what foods make you feel good physically. The goal of mindful eating is to feel better when you’re finished eating, not worse. 4. Consider balance when choosing what to eat. What does your body need and what have you already eaten? Do you need vegetables, fruit, protein, carbs or fat? 5. Think about what foods make you feel satisfied and allow yourself to have them. Remember that satisfaction is both mental and physical. Deprivation of our favorite foods rarely works. How many times have you said to yourself, “I’m never having ice cream again,” only to find eating a pint of Häagen-Daaz two weeks later. 6. While eating, pause periodically. Put your fork down, take a couple of deep breaths and check in with your body and your taste-buds. Notice if you feel any sensations in your stomach or if the food is starting to lose its luster. If we pay attention, even when eating our favorite foods, we may notice that things become too salty, sweet, creamy, etc. Try one or two of these tips at your next meal. You may notice that you feel much more satisfied when you eat when truly hungry and eat the foods that make you feel satisfied. If you balance eating for nutrition with eating for pleasure, you are eating mindfully. Eating is one of life’s great pleasures – just make sure it isn’t the only one! Molly Ellefson, MS, CHWC, is an Integrative health and wellness coach with the Penny George Institute for Health and Healing’s LiveWell Fitness Center. She will be teaching the eight-session “Am I hungry?® Mindful Eating Workshop,” based on May’s book, starting Sept. 25. Learn more about the class. Categories: Health and wellness, Mind body connection, Nutrition, Uncategorized, well-being | Tags: Am I hungry?, diet, digestive system, Eat what you love, eating well, eating with attention, eating with intention, gut, integrative health, Love what you eat, mindful eating, mindfulness, Minneapolis, nutrition, obesity, Penny George Institute, Penny George Institute for Health and Healing, portion sizes, weight management, well-being, wellbeing, wellness | Permalink. Most of us in Minnesota welcome the heat as a time to get creative about staying cool – lake swimming, popsicles, complaining about another dramatic weather system. 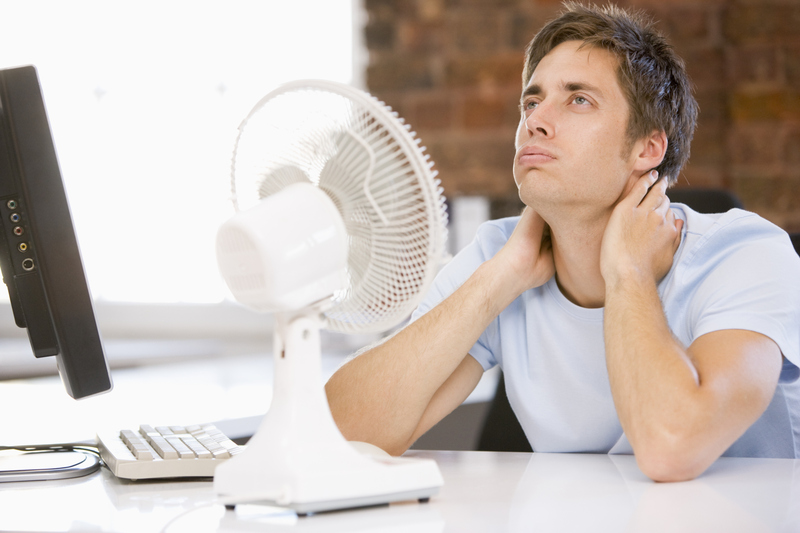 But hot weather can bring with it a series of symptoms. Although this summer hasn’t been the hottest, July’s humid foray into the 90s brought with it a shift in patient complaints at the Penny George Institute for Health and Healing clinic. Suddenly I had more people complaining of seemingly mysterious fevers, nausea, diarrhea, sweating, dizziness and a heaviness of the head (or the whole body). Some also had respiratory issues that led them to believe they had caught a cold or flu, but most complained that their symptoms were “random” and seemed strange and unexpected to them. This pattern can affect everyone but seems most prevalent in children, the elderly and 20-something apartment dwellers without air conditioning. So what do you do if you experience these symptoms? First, make sure that you’re not suffering from other symptoms that might indicate you are actually suffering from heat exhaustion or heat stroke (fainting, dark-colored urine, rapid heart rate, confusion, throbbing headache, red and dry skin). Seek immediate medical attention if these occur. Watermelon: Enjoy the red flesh of the melon, but the most potent medicine can be found in the white part of the rind. Eat down into that as far as you can. This is a mild diuretic. Mung Beans: These small green legumes originated in India, but are now grown all over Asia and in hot, dry parts of Europe and the United States. They can be found dried at most co-ops and natural food stores. Boil a cup of dried mung beans in about three cups of water. Drink the liquid. This is also a mild diuretic. Electrolytes: With the sweating of Summer Heat, be sure that you are replenishing your fluids and electrolytes. My personal favorite is coconut water, but other sources of electrolytes are Smart Water, Emergen-C, and sports drinks – each with their own pros and cons. Try them all and see which your body prefers. And if heat is a problem, cool down! Take cooling baths. Rest. Then get back out there to your lake swimming, popsicles and complaining about the weather. Enjoy summer while you can! Categories: Acupuncture, Health and wellness, Traditional Chinese Medicine, Uncategorized, well-being | Tags: acupuncture, electrolytes, integrative health, Managing heat, managing summer heat, Minneapolis, Oriental Medicine, Penny George Institute, Penny George Institute for Health and Healing, Staying cool, summer cold, summer flu, Summer Heat, Traditional Chinese Medicine, Twin Cities, well-being, wellbeing, wellness | Permalink. Summer in Minnesota brings family reunions, outdoor cookouts and weekends at a cabin or camping with friends and family. These events tend to center around food, and often times we find ourselves gathering around an outdoor grill. By late summer, you may be tired of the usual hamburgers, hotdogs or chicken breasts, but grilling isn’t just for meat or veggie burgers. You can cook up many foods that you may not have thought about. With fresh, local produce arriving at farmers’ markets, this is the perfect time to put a new spin on your grilling techniques! Pizza is a favorite of many, and grilling your next homemade pizza eliminates using the oven. Choose the right toppings, and you have a healthy, delicious meal! Start with a whole wheat crust, spread it with tomato, pesto sauce or olive oil, and pile on sliced veggies such as broccoli, zucchini, tomatoes, onions and peppers. Add some lean meat or low-fat feta or mozzarella cheese if desired. Place the pizza directly on the grill, close the lid and wait for desired doneness. Then slice and enjoy! 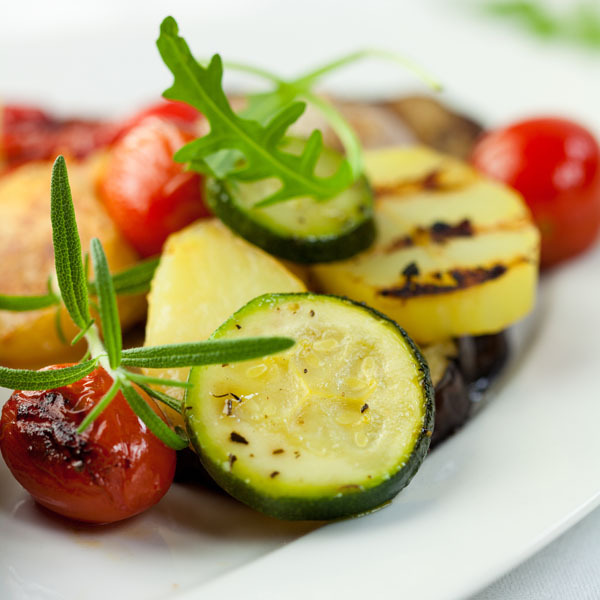 Many of the summer veggies are delicious grilled! You can lightly coat asparagus spears with olive oil and spices, and lay the spears on the grill crosswise for about 5 minutes. Zucchini and summer squash are easy to grill as well. They can be cut lengthwise into quarters, brushed with olive oil and grilled to desired tenderness. Foil packets are an easy way to grill veggies that are too small to place directly on the grill, such as carrots, tomatoes, onions, green beans, mushrooms and peppers. Use heavy-duty foil and spray one side with cooking spray, add veggies and spices, completely close the packet and place on the grill. Flip the packet once during cooking and expect cooking time to be 25-30 minutes. Fresh fruit grilled is a sweet summertime treat! Try a whole, peeled banana, and slices of peach, apple, pineapple or pear directly on the grill. Larger slices are best to prevent burning. Add grilled fruits to a salad, top your protein source with them, or enjoy them as a side dish or a sweet, healthy dessert. Just thinking about grilling fresh veggies and fruit has my mouth watering so I’ll be heading to a farmers’ market this week for some local veggies to put on my grill! For more healthy recipes, visit Allina Health’s recipe page. Jeannie Paris, RD, LD, is a Registered Dietician with the Penny George Institute for Health and Healing’s LiveWell Fitness Center. Categories: Health and wellness, Nutrition, well-being | Tags: digestive system, griling fruit, griling vegetables, grilling, healthy food, healthy grilling, healthy grilling recipes, integrative health, Minneapolis, Penny George Institute, Penny George Institute for Health and Healing, recipe, Twin Cities, weight management, well-being, wellbeing, wellness | Permalink.